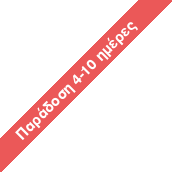 Κωδικός : 15956 additional accumulator for lengthening the flash time to PBS-400 about approx. 220 ..
Κωδικός : Wal-17239 mobile flash head with powerful 400Ws ideal for mobile work outdoor and on ..
Κωδικός : 17457 gives direct light creates a round, natural reflection in the eye especiall..
Κωδικός : Wal-17240 mobile flash head with powerful 600Ws ideal for mobile work outdoor and on ..
Κωδικός : Wal-17241 mobile ring flash head with powerful 400Ws ideal for mobile work outdoor an..
Κωδικός : 100396Αυτή η ισχυρή και εναλλάξιμη μπαταρία παρέχει 215-50,000 λάμψεις σε μία μόνο φόρτιση..
BBGv2 is our PMG Flash Bracket designed for Cameras with a Grip (Canon 1Dx, or Nikon D4s, D4)..
Κωδικός : 901108Κεφαλή Φλας συμβατή με την Γεννήτρια Φλας Profoto B2 250EAN – Code : 7340027537985..
small – lightweight - powerful mobile flash with powerful 600Ws ideal for mobile out..
portable power supply for mobile power with powerful 750 W lasting output up to 2.. The A1 is every inch a Profoto light – just smaller. Its round head delivers light that’s both natur..